"Serious about having fun." "Be true to your dreams." 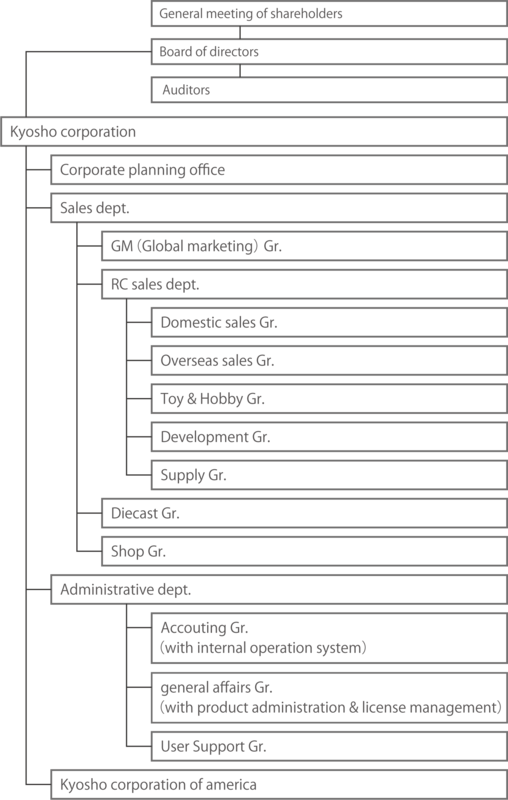 Cultivating a corporate culture of emotional involvement with the organizatoin. Make products that inspire people through surprise and discovery. Cultivate an organization that combines imagination with the technological capability to successfully transform ideas into exceptional products. For this purpose, staff and departments within Kyosho communicate and work as a team, inspiring and supporting each other. This internal cooperation not only results in inspirational Kyosho products, but also provides an opportunity to learn from each other through the process. By owning a Kyosho product and discovering its full capabilities, the owner can achieve greater enjoyment and a depth of appreciation than ever thought possible. The intrinsic value of a Kyosho product is measured by its success as a source of enjoyment, which is far greater than any financial value. 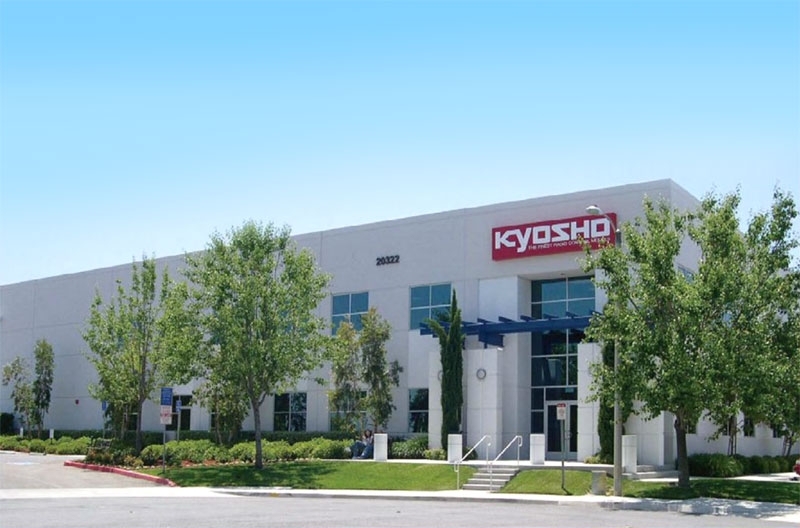 Kyosho workmanship must mean more than an industrial product, and this forms the basis of our management philosophy. ・ Kyosho Corporation established in October in Tokyo to market models, toys and sundry goods both domestically and internationally (capital ¥2,300,000). ・ New paid in capital of ¥8,000,000. 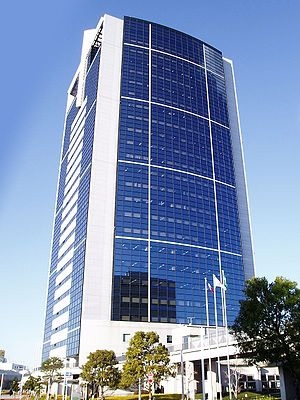 ・ Head office building constructed (total 1,600 sq. meters, 7 floors & 1 basement floor). ・ Sales of RC cars commenced in Japanese domestic market. ・ International distribution network established. ・ New paid in capital of ¥521,160,000(allocation of new shares to third party). ・ Relocated to new Atsugi building, 9 floors, approx. 6,000 sq. meters. ・ Sponsor "Brabham Yamaha" formula car racing team. ・ Production and sale of Die-Cast models commenced. "Consumer Direct Parts Shipment" commenced. ・ Sponsor "Sasol Jordan Yamaha" formula car racing team. ・ Hisashi Suzuki, founder, appointed as Chairman. ・ Akihisa Suzuki appointed as President. ・ Mini car gallery "PIT" Nagata-cho (Tokyo) branch opened. ・ First Kyosho World Cup held in Philippines. 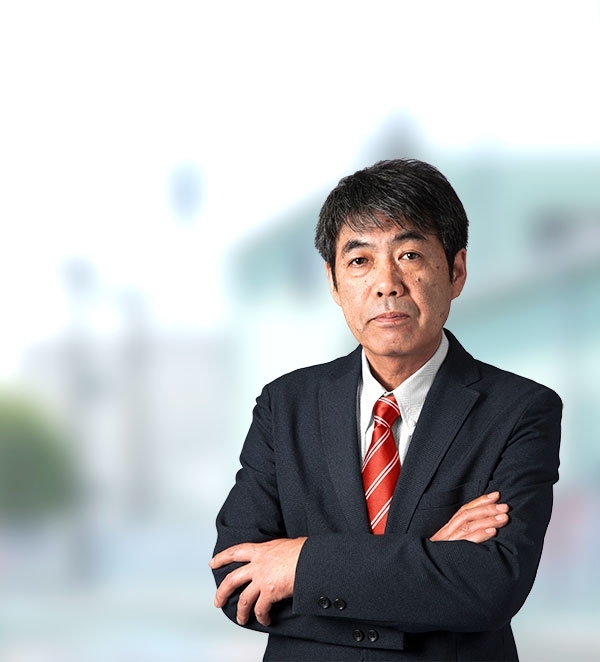 ・ Hisashi Suzuki appointed as Executive Consultant. ・ Second Kyosho World Cup held in Japan. ・ Third Kyosho World Cup held in Hawaii, USA. ・ "Mini-Z Racer" series, RC industry's first palm-top size RC cars, released. ・ Mini car gallery "PIT" Daikanyama (Tokyo) branch opened. ・ Mini car gallery "PIT" IKSPIARI (Kanagawa) branch opened. ・ "Mini-Z Racer Formula Car" series released. ・ "Palm Runner," value version of palm-top size RC car, released. ・ "Gun Walker," two legs walking RC robot series, announced. ・ OEM supply of Die-Cast models to BMW, followed by Smart, Mercedes, Nissan & Mazda commenced. ・ "Inferno" won 6th consecutive title at the IFMAR 1/8th Nitro Offroad Buggy World's. ・ Fourth Kyosho World Cup held in Beijing, China. ・ Mini car gallery "PIT" Yokohama branch closed and La Chitta Della (Kawasaki) branch opened. ・ "FV1000," RC aircraft, and "Caliber 30," RC helicopter received the Model of the Year Award. ・ "Evolva2003" won both TQ and world championship title at the IFMAR 1/8th Onroad Racing World Championship. ・ "Mini-Z Time" website commenced. ・ "Mini-Z Style" mook published. ・ "CVS Mini Car Collection" commenced. ・ Fifth Kyosho World Cup held in Dubai, UAE. ・ "V-One RRR" dominated the IFMAR 1/10 GP Touring Car World Championship in Brasil with TQ, championship title and 8 A-main finalists. ・ Revenue reached ¥10 billion. ・ Kyosho Corporation of America commenced in April. ・ "Inferno MP777" received 2005 Reader's Choice The Best Nitro Buggy Award at "RCX" exhibition in USA. ・ Akihisa Suzuki appointed as Chairman. ・ Masayuki Suzuki appointed as President. ・ "Kyosho Omotesando" opened in Omotesando Hills. ・ "Kyosho Fair & Miniature Model 2006" held at Maruei department store. ・ "Inferno MP777" won 7th championship title at the IFMAR 1/8 Nitro Offroad Buggy World Championship. ・ "Manoi AT01," two legs walking humanoid robot, released. ・ First Kyosho Athletics Humanoid Cup held at Omotesando Hills. ・ "Manoi PF01," two legs walking humanoid robot, special limited color edition released. ・ "dNaNo," 1/43 desk-top RC, released. ・ "Kyosho Akihabara" opened in Akihabara. ・ "RC Garage Route 246" opened next to Kyosho building. ・ "RC Planning Route 246," a new parts brand, commenced. ・ "MR-03," Mini-Z Racer third generation chassis, released. ・ "Kyosho Makers Okabe Jidousha RX-7" celebrating Mini-Z 10th anniversary attended Super Taikyu, Japanese Endurance Race. ・ Cumulative sales of CVS Mini Car Collection reached 10 million units. ・ Cumulative sales of Mini-Z Racer reached 800,000 units. ・ "Kyosho Egg" brand commenced. ・ "KF-01," GP formula car, released. "NFO," a race organizer for KF-01, established. Online race organizing system established. ・ "Dslot43," 1/43 scale Kyosho original slot car series, developed and released. ・ "Kyosho Egg Gold Label," unique toy RC brand, commenced. ・ "EZ series Sandmaster/NeXXt," new concept RC buggy kit assembled by a single screw driver, released. ・ Popular and memorial models such as "Optima,""Lazer ZX-5," & "Inferno MP9" added to Mini-Z series. ・ "Mini-Z Moto Racer" with cutting edge technology and super micro motor released. ・ "Mosquito," 3 channel RC helicopter with a finger-tip sized gryo, released. ・ "Scorpion XXL VE" in massive 1/7 scale with aggressive performance released. ・ "Calmato Alpha 60 Sports EP/GP," lower wing trainer with divisible fuselage and main wing, released. ・ "RC Gomiba GO" & "RC Sugoi Mop" received high popularity for their uniqueness. ・ CVS Mini Car Collection rearched total 63 series in 1,569 kinds in its 10th anniversary year. ・ Kyosho's 50th anniversary. Memorial book published. ・ "Kyosho Village" opened in Tokyo Venus Fort. ・ Mini-Z's 15th anniversary. Cumulative sales reached 1.5 million units. ・ "Optima," Kyosho's lengendary model, re-released. ・Kyosho Die-Cast Model's 25th anniversary. ・Worldwide release of "Drone Racer," a racing drone for ultra-low altitude, on November 25. ・"Kyosho On-board Monitor," easy-to-operate FPV (First Person View) monitor system, released. ・"Kyosho Ride-On System 4D Experience," a concept machine exploring potential shift of RC driving way from 'viewing' to 'riding,' developed. General manager of Sales Dept.